The Hillsboro School, nestled on 30 acres in Helena, Alabama, offers an inviting environment where students learn based on what they are capable of, rather than being limited by their age. Hillsboro students are given the opportunity to experience and apply “real world” knowledge and skills. 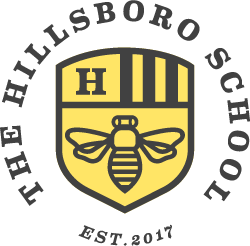 At Hillsboro, our mission is to design an environment that empowers our students to become the people they are meant to become. We prepare our students for fulfilling and purposeful lives. Because we want them to strive for excellence in everything they do, we emphasize healthy habits academically, emotionally, socially, spiritually, and physically. In the top left, the “H” symbolizes our commitment to being a second “H”ome as Maria Montessori envisioned; a community that shares some of the personal depth and meaningfulness of family life as we actively engage in our home, “H”elena, which was originally named, “H”illsboro. Lastly, honeybees on their own are simple insects. In a hive of thousands, they are known as a superorganism. They are highly organized, masters of communication, and thrive without damaging their environment or harming other organisms. In fact, their relationship is synergistic. Honeybees pollinate the flowers of thousands of species of plants, boosting their fruit production and ensuring legacy of the species. The honeybees take the nectar and pollen gathered from flowers to produce honey and bee bread to sustain the hive over the winter. The honeybee is a master of stewardship that models purposeful life.